As of 10 months ago, I, a 29-year-old female, was not even on Facebook. Mr. Pax and I joked about how I needed to learn how to “twitter” stuff so I could keep up with what was happening. But let’s be honest, with two toddlers at home and one on the way, I’m pretty sure that even if aliens landed in Washington DC, I would be at least a week late to find out. But, like so many of you, I dream that my home would be a haven… for me, for my family, for our friends, for all who step across the threshold. And, though it may be a little old-fashioned of me, I really enjoy the “home-ec” spectrum, if you will. I take pleasure in being a homemaker. Let’s be clear about something, though. I don’t want you to get any misconceptions… My weekend was not spent in a frilly apron baking chocolate cake (though I do LOVE chocolate cake, especially this one); it was spent running around at the park with my two boys, overseeing plumbers as they moved the water for my washer and dryer to the other side of my laundry room, remodeling a closet (to function as a broom closet), and helping Mr. Pax decide how to patch the enormous hole in the floor of our laundry room. I love power tools, and I’m not afraid to use them. So how is that related to blogging? By sharing my experiences with home, life, designing bathrooms, making curtains, painting armoires, raising two little boys, and remodeling closets, I hope to remind myself of why I do these things. I don’t repaint rooms (something I do far too often, if you ask Mr. Pax), or cribs, or antique boxes because I want people to think I have a beautiful home. I want to have a beautiful home because I want my home to be a place where people want to be. A place where we can have a party, make a total mess, and enjoy ourselves silly. A place where my children can learn what is good and true. A place where peace can be found. Grease 8"x8" baking pan or 8 1/2 pint mason jars. 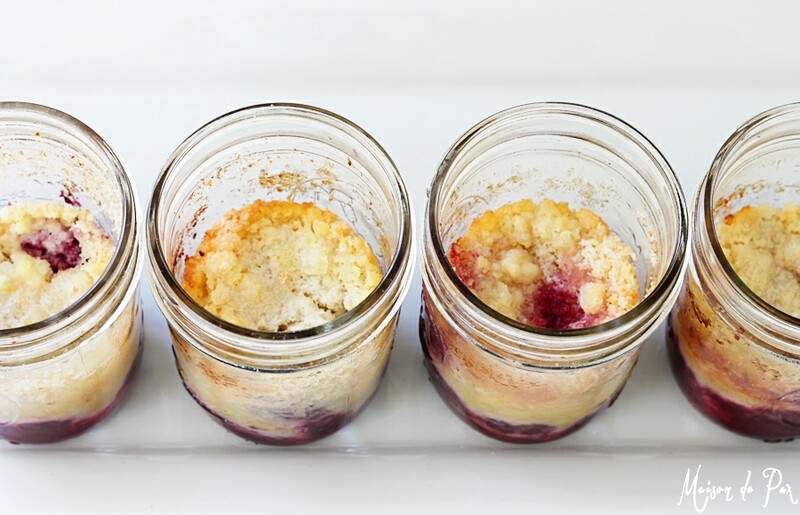 Mix fruit, lemon juice, and vanilla in baking pan/jars. In a bowl, mix egg, sugar, and flour into a course meal. Bake 30 min for mason jars or 45 for 8x8 pan (until a little brown). 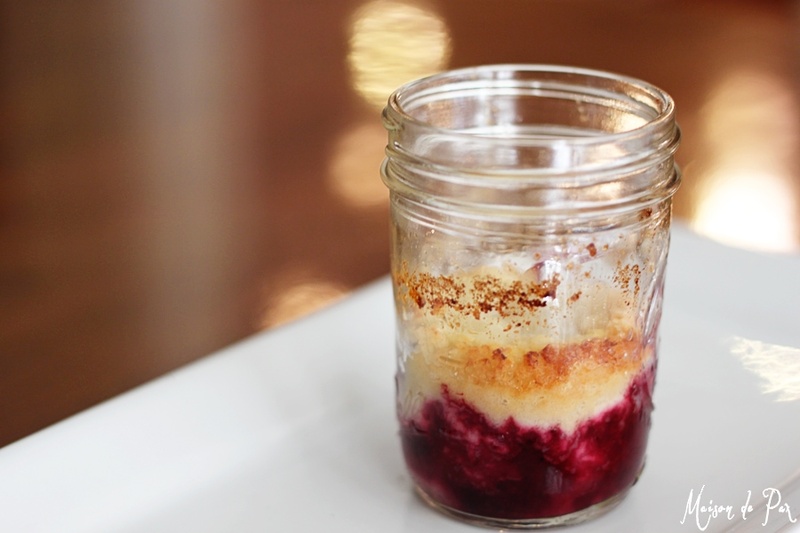 1/2 pint mason jars are perfect for individual servings. 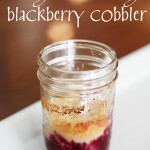 Plus, there's just enough room above the cooked cobbler to add a scoop of vanilla ice cream before you serve. Delicious and adorable! 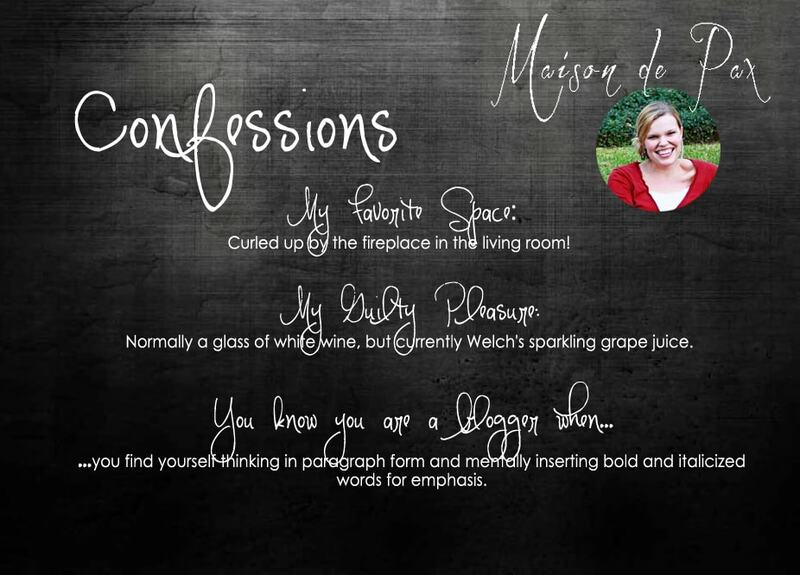 While you’re here, don’t miss the other amazingly talented women also sharing their “confessions” this week: Gwen at The Makerista, Aniko at Place of My Taste, Ursula at Homemade by Carmona, and KariAnne at Thistlewood Farms. 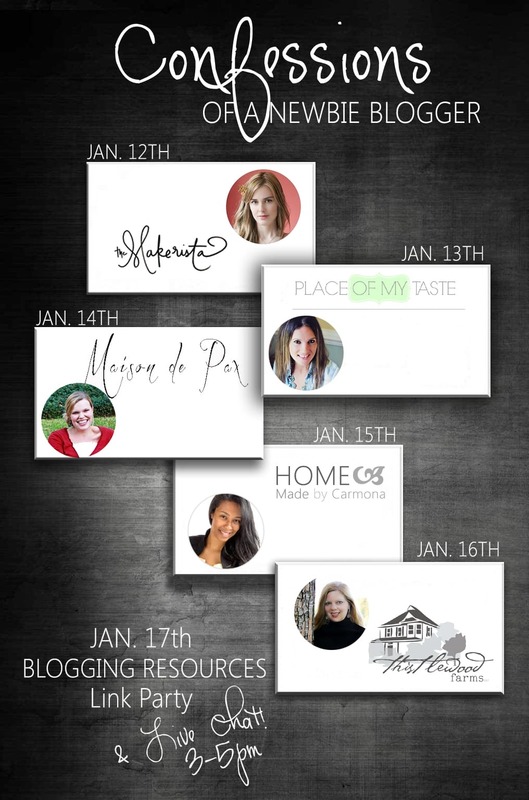 Plus, join us this Friday for a round up of fabulous blogging resources and a chance to link up your own tips and brilliant ideas! I absolutely love what you said about your home not being beautiful as to ‘please’ other people, but instead as to serve as a loving place where people are comfortable. A home shouldn’t be a display of things you can’t touch or sit on – a home is exactly what you described it as! Thank you so much, Ursula! It was such a pleasure to process through these things and share; I’m so glad you organized this! 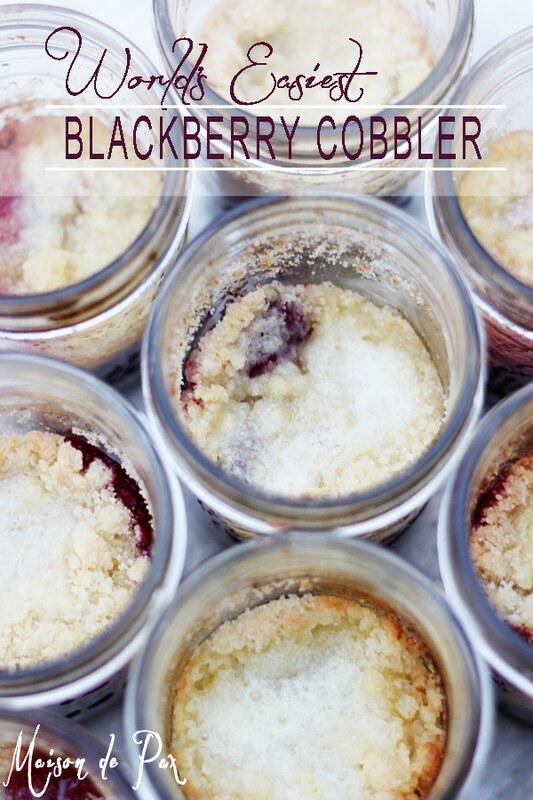 Loved your post, Rachel!…and this blackberry cobbler looks so good! BTW: I still don’t know how to twitter-LOL! Thanks, Aniko! So happy to know I’m not the only one struggling with this social media stuff. 🙂 Have a great night! All of you ladies participating in this helpfull ideas are great.I too do not have a Facebook and only started using instagram because I like photography.Theirs so much to Learn. Thanx again for all this information. Well doesn’t that look delicious! It was lovely to hear a bit about your heart, Rachel! You sound warm, hospitable, and like a wonderful wife and mother! Blessed to share this week with you. Thanks, Gwen! It’s such a challenge and privilege to juggle family, home, and blogging… I’m so blessed to know others are out there striving alongside me! I totally agree with you about the reason for creating a beautiful home- as a place for all to enjoy and feel comfortable in. Ours has become our main family space for all gatherings now and we love it! Isn’t it wonderful to have your home filled with loved ones like that?!?! So glad we share that passion, Krysta! What a beautiful blog you have! Love your photos! Glad I stopped by from the link-up on Thistlewood Farm! This looks fabulous! 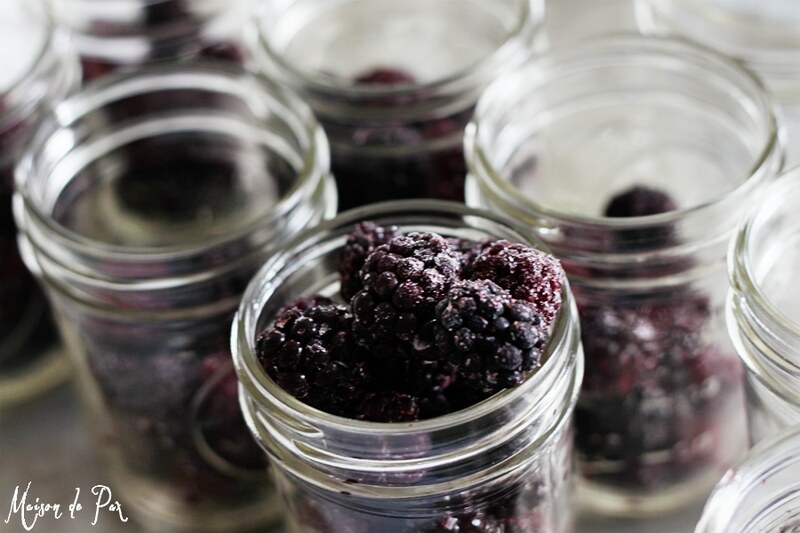 I always have blackberries in my freezer, and often want just a little something sweet. I know what I’ll be making for dessert tonight! That sounds so idyllic, Ann Marie! I’m so glad it reminded you of good times. 🙂 I hope you enjoy the cobbler and have a wonderful week! You had me at easiest 🙂 And then again at blackberry! 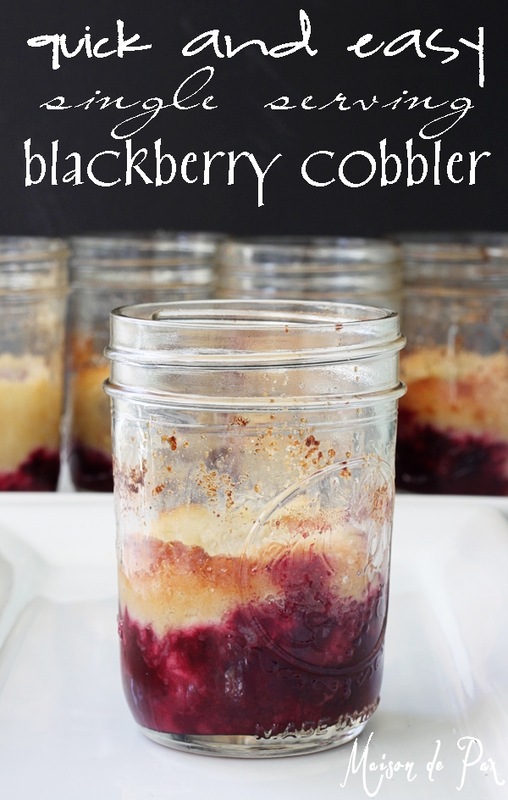 I ADORE blackberries & can’t wait until they’re in season because we will DEFINITELY be making this recipe! Stopping by from Dream to Reality to invite you to link up at Tasty Tuesdays, where I pin every post shared: http://anyonitanibbles.blogspot.co.uk/2014/01/tasty-tuesdays-45-stumbleupon-blog-ops.html Hope to see you there! Yay! I’m so glad you’re excited about the cobbler, Anyonita! I hope you enjoy it!! You never have to apologize for leaving me a nice comment, Angie!! No matter how long. 😉 I know you have a house full of kids, but it sounds like your heart is just right to love them well. Enjoy it!! Oh my gosh, I’m so glad I just found this series and your beautiful blog! As a new blogger, it is so refreshing to feel like I am not the only one technically challenged (even though by the looks of this gorgeous site i don’t believe you!) 🙂 And you had me at coffee, kahlua choclate cake!!!! I’m so glad to have you, Kate! And trust me when I say that it has taken me HOURS to get this far. 😉 Better yet, if you asked me to replicate it, it would probably take just as long! Really, I’m so glad you came by, and I wish you all the luck (and kahlua cake) in the world!